Political Parties play a key role in democracies as they contest elections, form governments, formulate policies and are responsible for providing governance and improve the lot of the common man. Political parties need access to money in order to reach out to the electorate, explain their goals/policies and receive inputs from people. But where do they collect their funds from? An analysis of their Income Tax returns and statements filed with the Election Commission of India (ECI) shows that the sources remain largely unknown. At present, political parties are not required to reveal the name of individuals or organizations giving less than Rs. 20,000. As a result, over two-thirds of the funds cannot be traced and are from ‘unknown’ sources. This becomes very relevant in the light of recent events when demonetization was announced so as to weed out black money from the society. While the National Political Parties were brought under the RTI Act by the CIC ruling in June 2013, they have still not complied with the decision. Full transparency is, unfortunately, not possible under the current laws, and it is only the RTI that can keep citizens informed. The contribution statements, submitted by the political parties declaring names and other details of donors who contribute above Rs 20,000, are the only known sources of income of political parties. 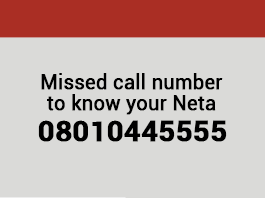 The unknown sources are income declared in the IT returns but without giving source of income for donations below Rs. 20,000. Such unknown sources include ‘sale of coupons’, ‘Aajiwan Sahayog Nidhi’, ‘relief fund’, ‘miscellaneous income’, ‘voluntary contributions’, ‘contribution from meetings/ morchas’ etc. The details of donors of such voluntary contributions are not available in the public domain. 6 National parties (INC, BJP, BSP, NCP, CPI and CPM) and 51 Regional recognised were considered for this analysis, including AITC which was declared a National Party only in September, 2016. Currently there are 48 Regional recognised parties: HJC-BL and MSCP merged with INC during FY 2014-15 and MPP was de-recognised in 2013. Total income of National and Regional political parties between FY 2004-05 and 2014-15: Rs 11,367.34 cr. Total income of political parties from known donors (details of donors as available from contribution report submitted by parties to Election Commission): Rs 1,835.63 cr, which is 16% of the total income of the parties. Total income of political parties from other known sources (e.g., sale of assets, membership fees, bank interest, sale of publications, party levy etc. ): Rs 1,698.73 cr, or 15% of total income. Total income of political parties from unknown sources (income specified in the IT Returns whose sources are unknown): Rs 7,832.98 cr, which is 69% of the total income of the parties. During the 11 years between FY 2004-05 and 2014-15, 83% of total income of INC, amounting to Rs 3,323.39 cr and 65%of total income of BJP, amounting to Rs 2,125.91 cr came from unknown sources. Among the Regional Parties, Rs 766.27 cr or 94% of total income of SP and Rs 88.06 cr or 86% of the total income of SAD came from unknown sources. The income tax returns/ audit reports of National and Regional parties were obtained by filing RTI applications with the Income Tax departments. The income tax returns of 42 out of the 51 regional parties analysed were unavailable for at least one financial year. The information was either denied by the IT departments/ the parties had not filed their returns for the financial year/ the departments were unable to trace the audit reports/ incomplete information was provided. Where possible, copies of audit reports were procured from the ECI. The income of National Parties from unknown sources increased by 313%, from Rs 274.13 cr during FY 2004-05 toRs 1130.92 cr during FY 2014-15. 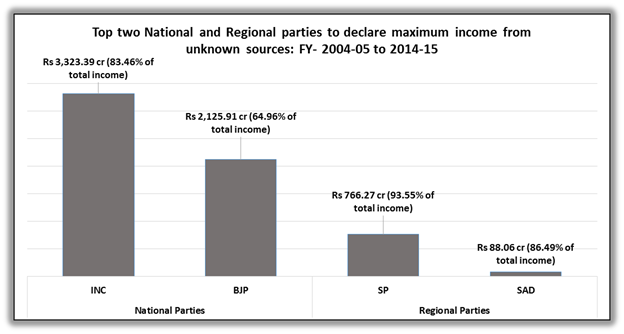 The income of Regional Parties from unknown sources increased by 652% from Rs 37.393 cr during FY 2004-05 toRs 281.01 cr during FY 2014-15. Among all the National and Regional parties considered, BSP is the only party to consistently declare receiving NIL donations above Rs 20,000 between FY 2004-05 and 2014-15 thus 100% of the party’s donations came from unknown sources. The total income of the party increased by 2057% from Rs 5.19 cr during FY 2004-05 to Rs 111.96 cr during FY 2014-15. For details of year-wise income of National and Regional Parties, share of various sources of income in the total income of political parties and the list of top 10 Regional parties with highest declared income from known sources, please click here to the detailed report.